This lesson is going to blow your mind (impress you a lot), as we’ve got a special treat (present) for you today. Music is one of the coolest, most fun, and effective ways to boost (quickly develop) your vocabulary and especially your pronunciation. But you have to have a good song, a good strategy, and a strong desire to work hard to consistently practice, learn, sing the song, and most importantly to IMITATE the singer. 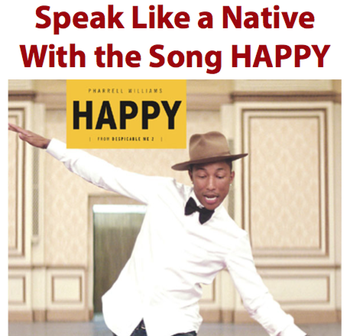 Today we’re going to use Happy, by Pharrell Williams, a song that has been all the rage (currently very popular), to teach you not only a set of new vocabulary, but also the dynamic pronunciation of native speakers and connected speech. Through repeatedly singing, imitating, and even recording yourself sing, you can learn to drastically improve your pronunciation and even speak like a native. It just takes a sincere desire, good strategies, and practice. There are over 25 examples of connected speech in this song, but here are a few of the more obvious ones. Today I’m going to break this song up (divide in parts), both the audio AND the pronunciation, and show you exactly how native speakers speak. I’m also going to change the spelling to reflect how we really speak (and not how you learned in school). Recommended use: With a teacher or alone, listen, repeat, listen, repeat. Sing along to get the rhythm of the song first, and then focus more on the individual parts. Depending on your level AND familiarity with this song, this may take several sessions to master. Remember, singing trains your muscle memory and your organs of articulation. Just like any type of physical exercise, with repetition and consistency, it gets easier and easier. To record yourself we recommend you download the FREE program audacity. Note: We choose NOT to use the IPA (International Phonetic Alphabet) because most people haven’t learned this. Thus, we’ve written it so more people can understand. What song would you like us to break down next? What song do you think is useful for other learners? Let us know so we have some ideas for future “Speak Like a Native with Music” articles! Have a great day. If you enjoyed this article and want to receive more like this one, we recommend that you join 10,000 other inspired English learners from around the world on our world class mailing list. If you enjoyed this article, here are some other relevant articles on learning English with music and pronunciation. Thank you! it’s the best way to improve my english! it was so useful! Oh I love this song, such a colorful song. It’s amazing singing along with the lyrics. I have the Audacity program, and I recommend it too, it allows us to record ourselves and to take away the audio converting it to *.mp3 format. So many things to do with that program. Thanks a bunch for this lesson. Love this song, love knowing more about that. Thank you Justin!! Awesome! Very well done! Thank you a lot!